Camera Rotation is a Light Painting technique that falls into the category of Kinetic Light Painting. 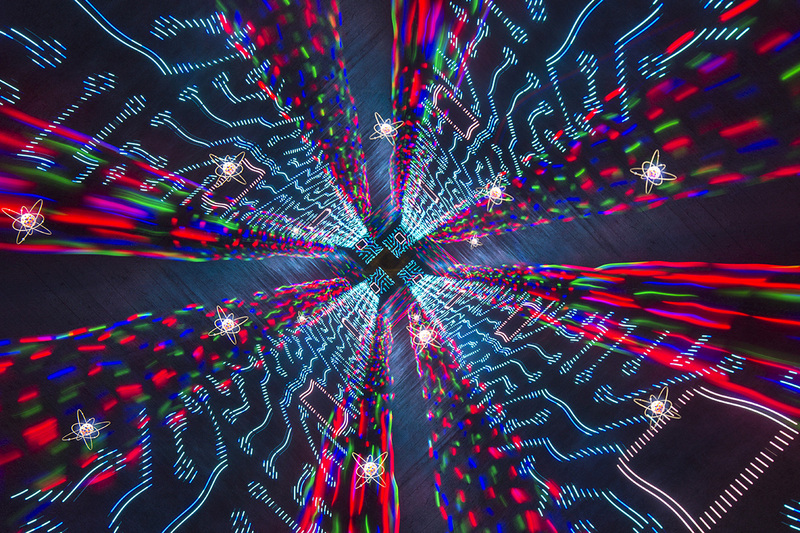 Kinetic Light Painting means that the lights in the scene generally stay stationary (although they don’t have to) and the camera itself is moved to create a design within the frame during a long exposure photograph. Camera Rotation is exactly what it sounds like. 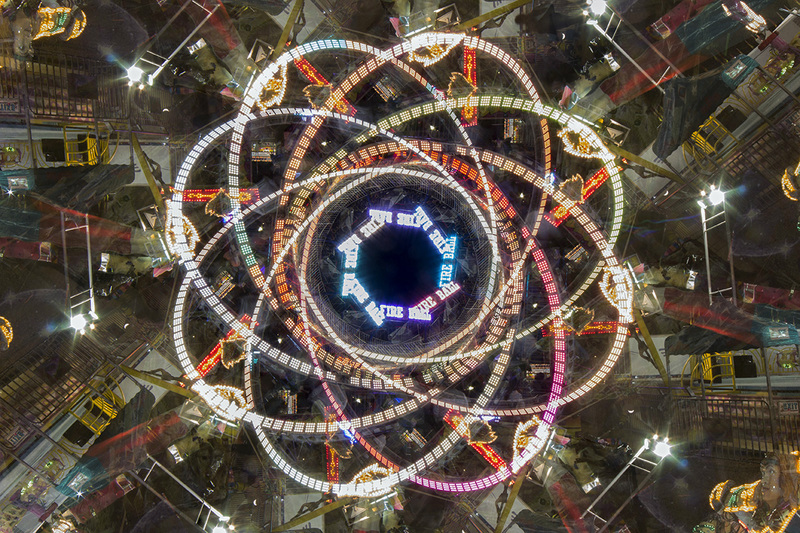 The camera, while attached to some sort of device, is moved in a 360º motion during a long exposure, This process can create absolutely mind boggling geometric madness from the most mundane of subjects. The history of this technique can be traced back to 1953 and image below from Photographer David Potts. Jump forward 63 years to now and this technique is still pretty rarely used. For this article I interviewed, Juls Boo, Jelle Schuurmans, Chris Thompson, and Johnny Dickerson a few of the Light Painters currently pioneering this lesser known technique to see exactly how they are creating their incredible Camera Rotations. Each of these Light Painting artists shared advice, the gear they use, and even walk us through how they created their favorite images so if you are inspired or gain some knowledge please let them know with a high five, a follow, and/or a thank you. First let me give a little background of how each of these Light Painters started creating these types of images. 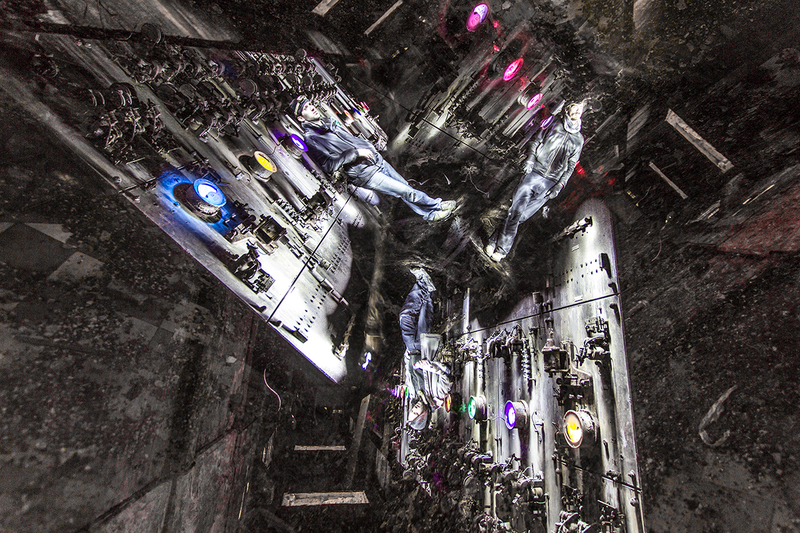 Juls and Jelle both started rotating their images in 2012. 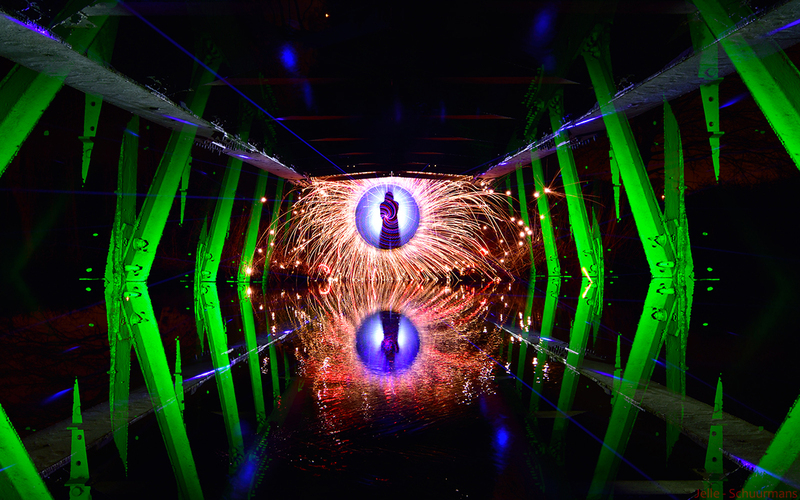 Chris began creating his camera rotation light paintings in 2013 and Johnny in 2014. 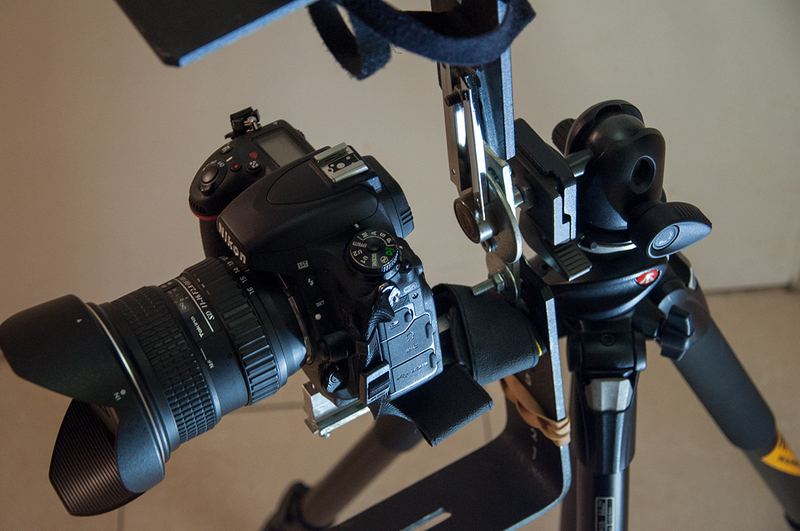 The inspiration to start doing camera rotations for both Jelle and Jules came from necessity. Juls lives in Paris, which is a pretty bright city, the lack of dark areas was forcing him to look at spaces differently to create his light paintings. 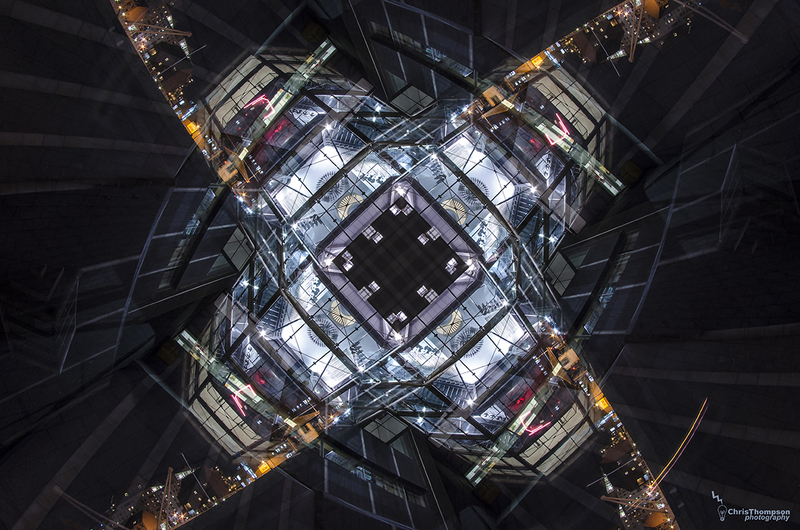 While walking around the city one night he was struck with inspiration of creating rotated images. Jelle’s inspiration was also born from necessity in that he had visualized an image that he wanted to create, but didn’t know how to do it. He was experimenting with double exposures when he got the idea for “Tunnel Frenzy”. To create the shot below he had to find a way to rotate the image around the lens axis to get this effect he wanted, so he began experimenting eventually coming up with a rig that allowed him to realize his vision. The tools for creating camera rotations for these 4 artist vary greatly. Juls and Jelle are using custom built CRT’s (Camera Rotation Tools) while Chris and Johnny are shooting with more off the shelf solutions. 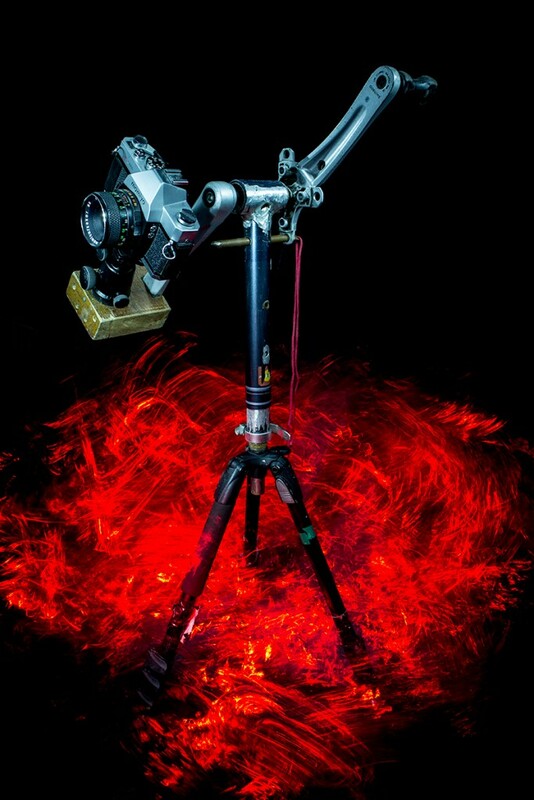 In true Light Painting innovation Juls took a bike from the trash and turned it into a device to rotate his camera. Jelle created his CRT (Camera Rotation Tool) from an industrial ball bearing and some strips of aluminum. If you don’t have the tools, space, time, or knowhow to build yourself one of these rigs thankfully there is a off the shelf solution! Chris and Johnny both use the Beike BK45 Tripod Gimbal that is intended for sports and wildlife photographers using long lenses. 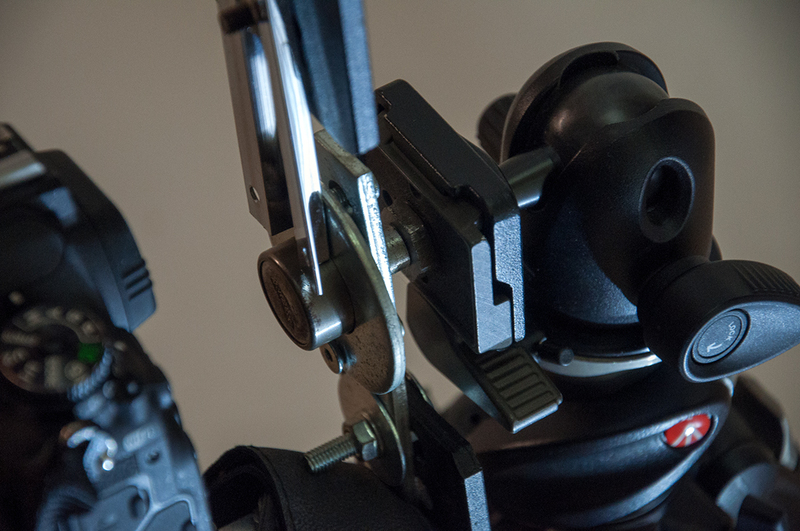 By simply turning your camera the tripod gimbal can be used for Camera Rotation. 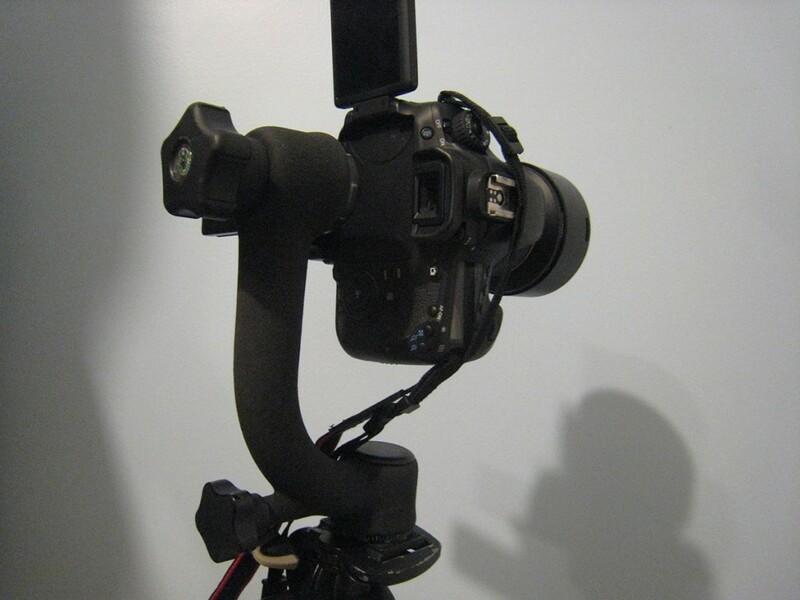 So lets say you have built yourself a rig or bought yourself a tripod gimbal now what? Well you need to find yourself something to shoot. Some of the favorites subjects of these artist are tunnels, bridges, and other everyday objects such as a corner of a building or angular architecture. One of the main things that all of these artist recommend looking for is something that is illuminated and surrounded by dark space. For instance a bridge, pier, or corner of a building. 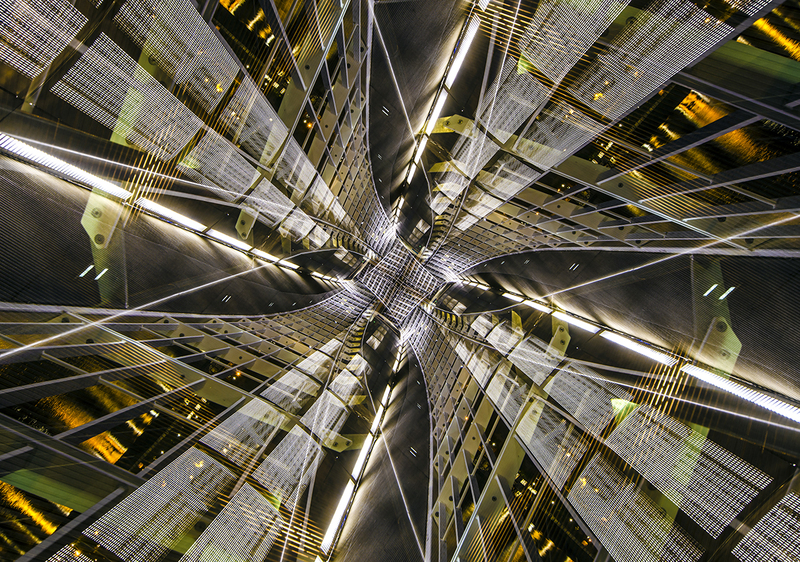 All of these make for incredible subjects for camera rotation, and believe me once you start rotating your camera you will look at the world through different eyes! Lets say you have found the perfect subject to shoot the next thing you want to do is get everything level. When you set your tripod up you want to make sure that your legs are locked down tight and all the bubble levels are centered. After spending an evening in my living room using Live View and aiming the camera at the lights on my internet modem, I found the center of the lens is just to the left of the white line of my level in Live View. With a silver Sharpie I marked the placement of the Gimbal whenever I choose to take it off, I can place it right where it was previously. Now when I prepare to shoot I use the Live View to adjust where the center of the frame will be. This is a great way to make sure you are finding center however also keep in mind what Jelle says “My CRT is not perfectly centered at all, and in a way this is something I thought would be a problem, but I found out that a bit off center CRT can give different cool looking patterns compared to a perfectly centered CRT. Now you are ready to shoot. What you need to do is find the proper exposure for your scene, an important thing to remember is that bright spots that overlap will tend to over expose because you are basically doubling up on the amount of light hitting that part of the film or sensor. If you have lots of overlapping bright spots you might need to stop down to find the right exposure for your rotation as your camera is accumulating light. A proper exposure for a static shot might be too bright for a rotation. Once you have your tripod level, you have found the center point of your lens, and the proper exposure its finally time to start rotating! There are a few different techniques to rotation the first is simply open the shutter and start spinning, this will create a trail of lights like the image below. I spotted the Liquor Store on a road trip and thought it would make for a cool rotation because it was illuminated, on a corner, and it also was surrounded by dark space. 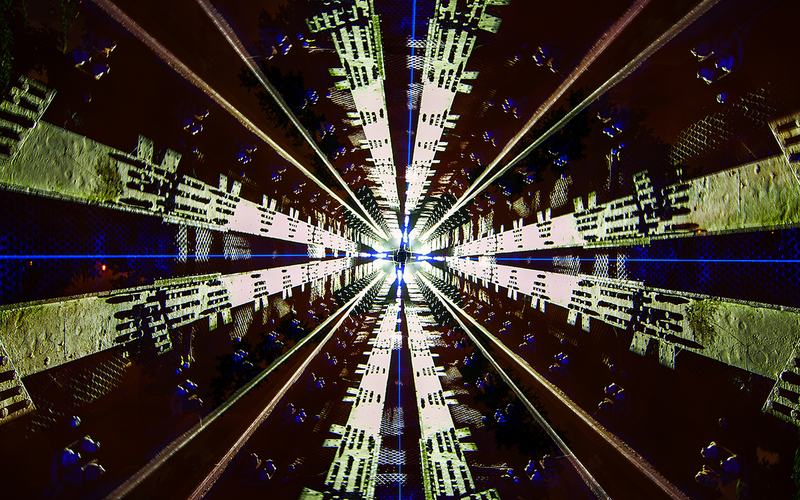 I simply open up the shutter of the camera and started rotating. Once you have a way to measure your angles you can then stop the rotations exactly where you want making precise movements and geometric pattern in your images. To make images like the examples below you will also need to cover your lens between the rotations. To begin start the exposure with the lens covered at 0º take the cap off and expose for the predetermined amount of time for a proper exposure (say 5 seconds), put the cap back on turn the camera to 45º remove the cap for another 5 seconds replace the cap, rotate and repeat the process for the full 360º rotation. Using the same Liquor store as an example from above these are some different rotations using the lens cap technique stopping on different angles and distances. And here are a few more examples of this technique from Johnny, Jelle, Chris, and Juls. 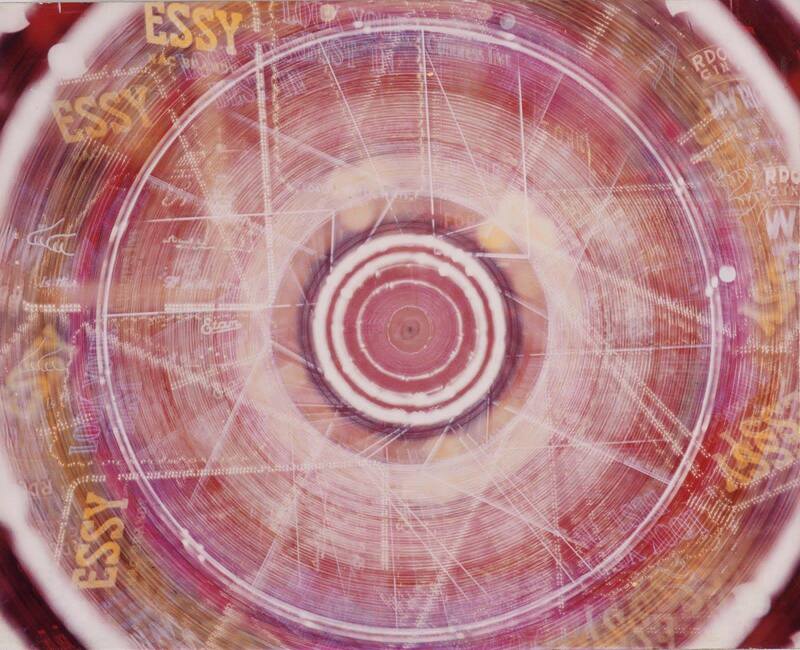 For the next section each of the artist is going to talk about how they created their favorite camera rotations, at the very bottom of the page you can read the full interviews from each artist for even more detailed information. 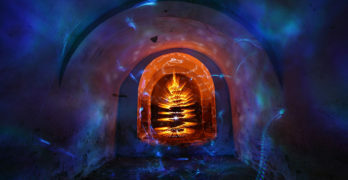 My favorite so far has been during a collaborative shot with another light painter, Tim Gamble, using two tripods. The main subject in this case, Tim, was focused and composed on Tripod 1 without a CRT, noting focus point, focal length and Tim’s positioning for later. The camera is then transferred to Tripod 2 with a CRT, this one is then aimed off centre so that the centre of the subject is on the left hand third of the frame when the camera and tripod 2 are located on the right of centre. This may sound complicated but all we then do is open the shutter on Tripod 2 and rotate the CRT while I spin an LED lit acrylic tube in a drill at the same time for one full 360 degree revolution on the CRT. The lens cap is then placed on and the camera moved back to Tripod 1, adjusting the previously noted focus, focal length and making sure Tim is on his marker. I then spin steel wool on a drill behind Tim with more LED lights in the mix. Hope this hasn’t confused anyone! I love this picture because in it there are all the ingredients I like in light painting. A pinch of urban exploration, light buddies and an environment favorable to share our passion for the light. This image was shot during a night in a former paper mill. I was with Alexis Pichot and Stéphane Babatasi, I set up my Gyrocam with an old control array of a huge machine in the center of my frame, slightly on the left. Then I show my buddies where we can stand up and each one of us take part in this image by posing and by illuminating. The center of the frame is a little lower than the feet of the models, so they are no overlay. When illuminating you need to stay focus on the subject and the remaining part of the picture should not be too bright because of the overlays. My favorite so far has been a carnival ride called “Fireball”. 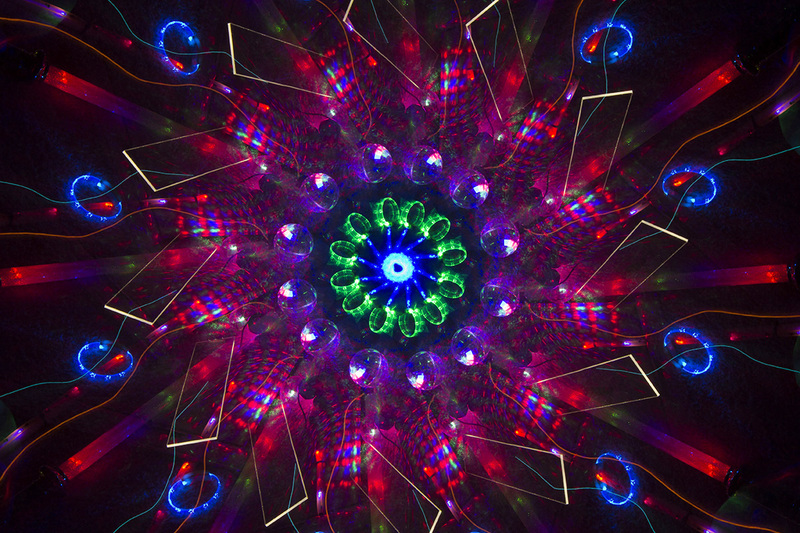 Being a ring of light, I was hoping by rotating it 6 or 8 times it would resemble an atom. It didn’t disappoint! I aimed the center of the lens near the edge of the ring of light. I exposed it for about 5 or 6 seconds (counting in my head), lens cap, then adjust the Gimbal 45 degrees then repeat, giving me an 8 way rotation. It ended up being about a 3 minute exposure (in the middle of a crowded Fair) but it was well worth it! My own personal favorite is one of my very first ‘real’ CRT shots I did in 2012, this was the first time it worked out just like I had in my mind and planned. 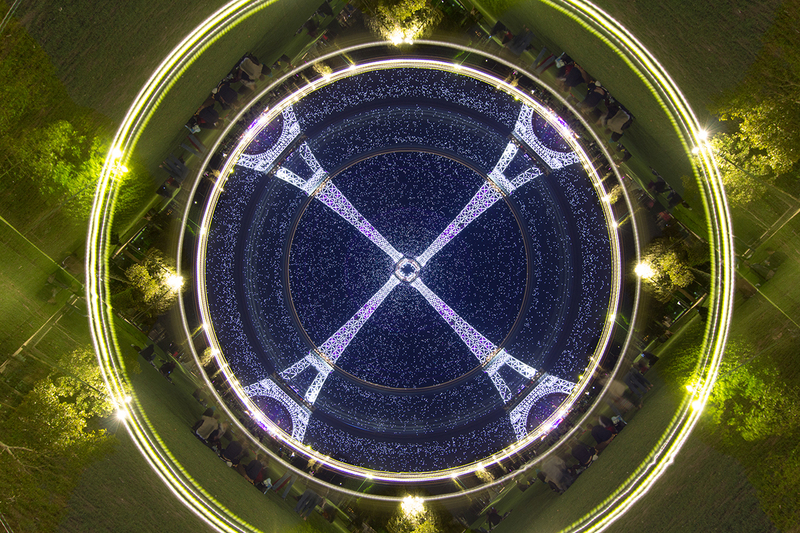 4 way rotation, 5 exposures in total. 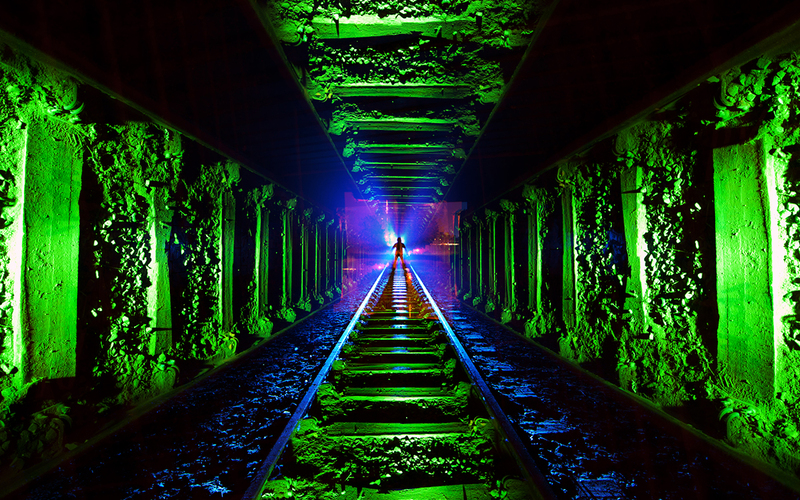 4 times lighting up the inside of the tracks with green, and 1 time with light blue light for the silhouette in the back and spill light on the outer sides of the tracks. The orange is from the street lights above this tunnel. 1- I start with lining up the normal horizontal shot. In this case I set the center focus point on the horizon where the two tracks meet. This will be the overall center rotation point of the final image. 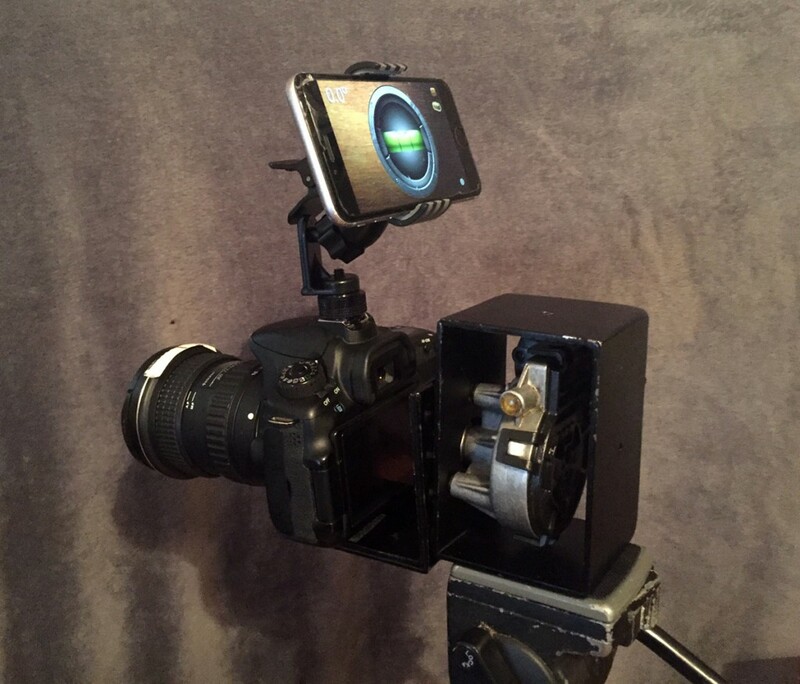 I use live-view to check the alignment of the setup by rotating the camera while using a flashlight to light up the scene. 2- Now I set the main camera settings, usually ISO 100 and Aperture 8-11. I do some test shots on how long I have to light up the insides of the tracks with a green flashlight, 10 seconds in this case. 4- Use green flashlight, after 10 seconds I put the lens cap back onto the lens. Now I rotate the camera 90 degrees. Remove the lens cap and expose for another 10 seconds using the green flashlight and put lens cap back on the lens. Repeat this 2 more times. 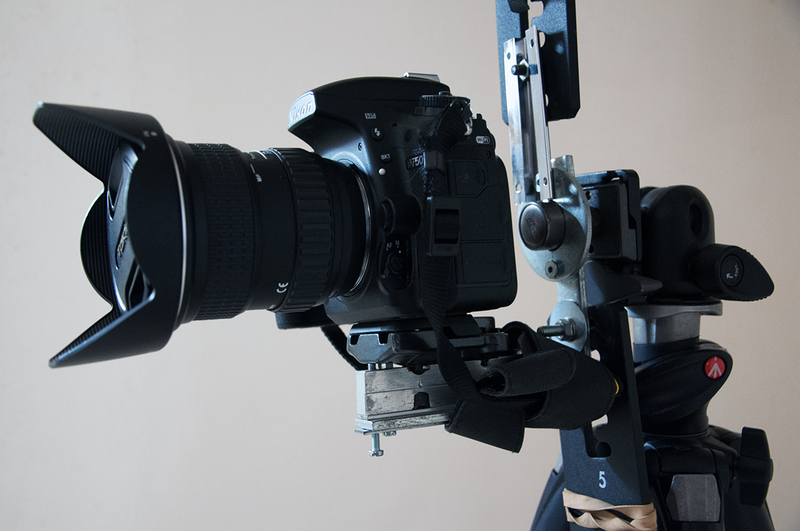 In total you rotate the camera 4 times, ending back in the same position as the first shot. 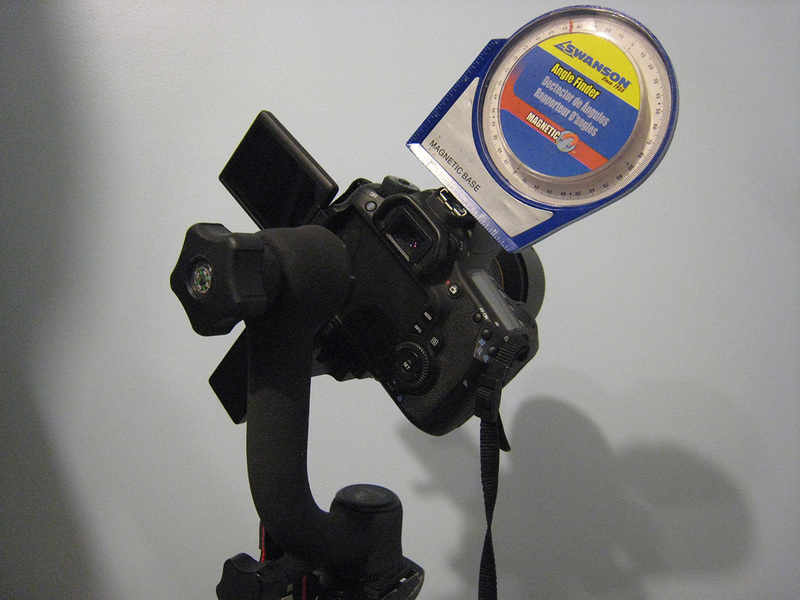 So you will have the base starting exposure, plus 3 exposures each 90 degrees rotated. Put lens cap back on the lens after the last 10 second exposure. 4- Position the camera horizontal again (that was the last rotation). Remove the lens cap for a 10 seconds exposure of a person standing on the tracks, back lit with a blue flashlight. Put lens cap back on the lens. 6- Check the final image. 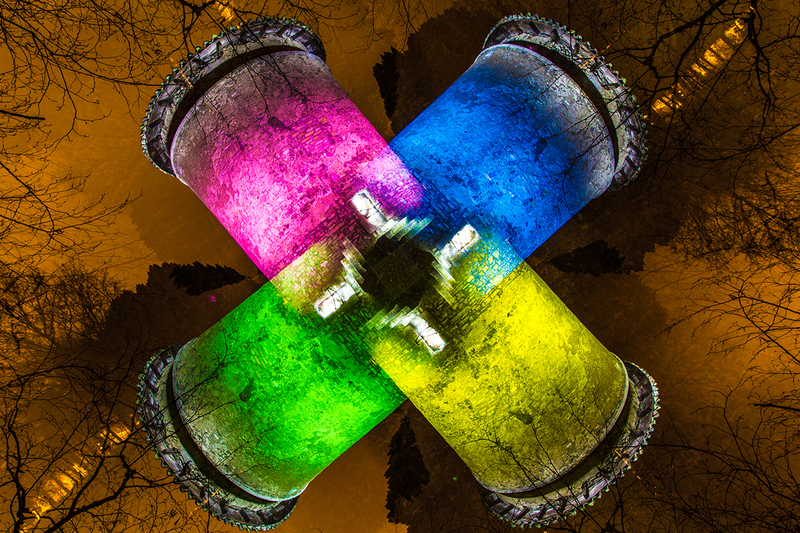 LPP ∇ How long have you been doing Camera Rotation Light Paintings? CT ∇ I started experimenting with the technique around the end of 2013. LPP ∇ How did you get started, what was the inspiration? Was there an image in your head that you wanted to make or did you just stumble into by some divine fate? CT ∇ I saw a rotated image on Flickr by Juls Boo which I found absolutely fascinating and quite literally ground breaking for me. He may not have been the first to make an image like this but it certainly resonated with me and my light painting ‘style’ I was using at the time. JULS ∇ Since I live in a very bright city I was often disappointed by the few dark places I can found, so I looked for another technique to do light painting. I get my inspiration from experimenting when I walk at night in Paris. JD ∇ I was first inspired by Jelle Schuurman’s “tunnel frenzy” (https://www.flickr.com/photos/jelle-s/8139659777/in/dateposted/), and having no clue how he lined the train tracks up so perfectly. Then Chris Thompson’s early work with the CRT of just random things around town had me wondering how he did it. 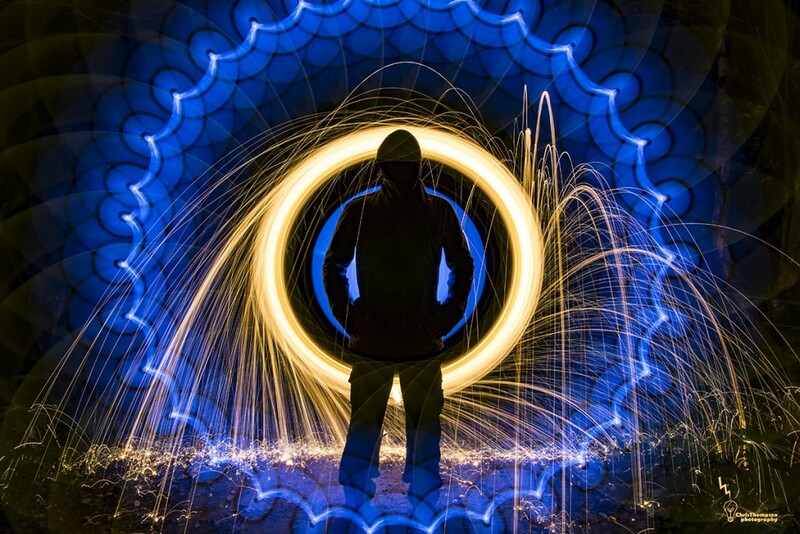 And then the mind blowing shots of Tim Gamble can provide inspiration for any light painter! I’m not so mechanically inclined so once I heard someone say the “Gimbal Tripod Head” works very similar I bought one right then and there! JS ∇ I was experimenting with double/multi exposures and then I got this idea of a possible shot (“Tunnel Frenzy”) a ‘tunnel with railroad tracks, but then with tracks on the sides and ceiling as well’. I knew I had to find a way to rotate the image around the lens axis to get this effect I wanted, so I started building and experimenting, what ended up in my custom built CRT. 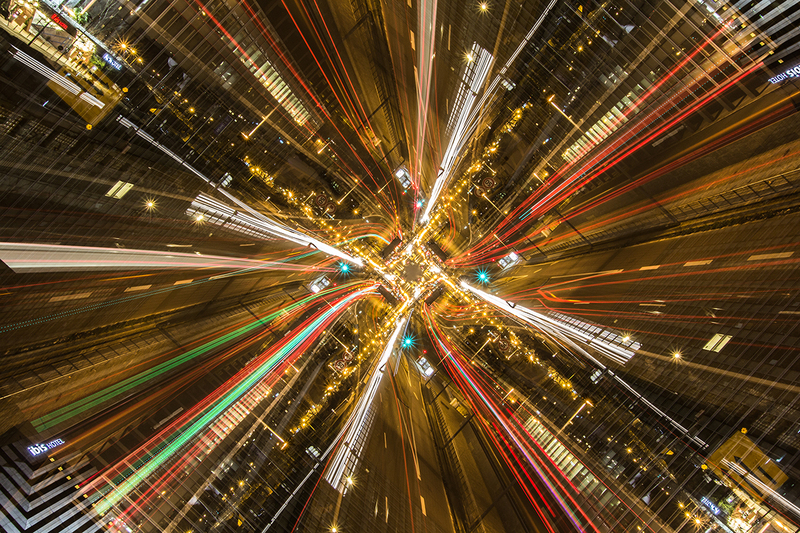 After a few test shots with it I finally created that shot I had in my mind, “Tunnel Frenzy”, so I was very happy with this result and that inspired me to continue and experiment even more with light painting photography and tools like the CRT. LPP ∇ What gear are you using? Gimbal, CRT, or something different? 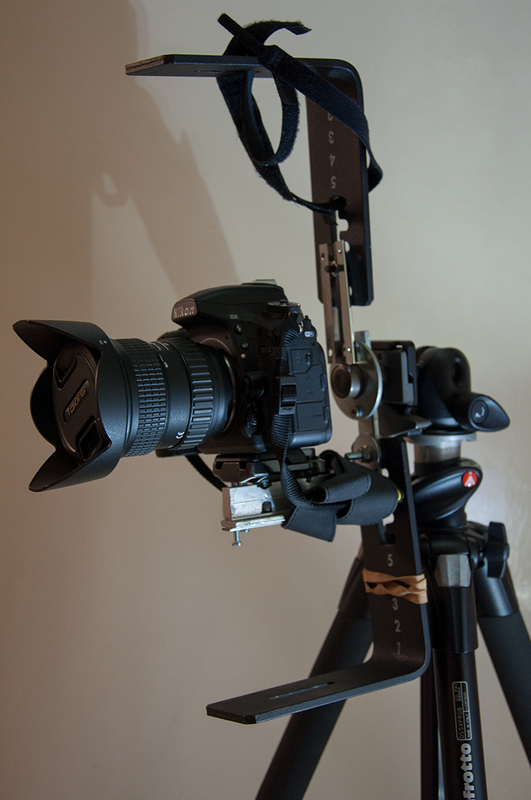 CT ∇ I am currently using a Beike BK45 Gimbal, a device intended for sports and wildlife photographers. When I first started out on the rotation journey, I developed, with my brother’s help, a camera rotation tool. We made several versions, some really “Heath Robinson” contraptions looking back but we finalized a design we were happy with. For me, my CRT is still the best way to rotate an image. JULS ∇ I use a trash bike found in the street… During year 2013 I improved it but it’s still the pedaling mechanism of an old bicycle. I mount on it a tripod ball head. 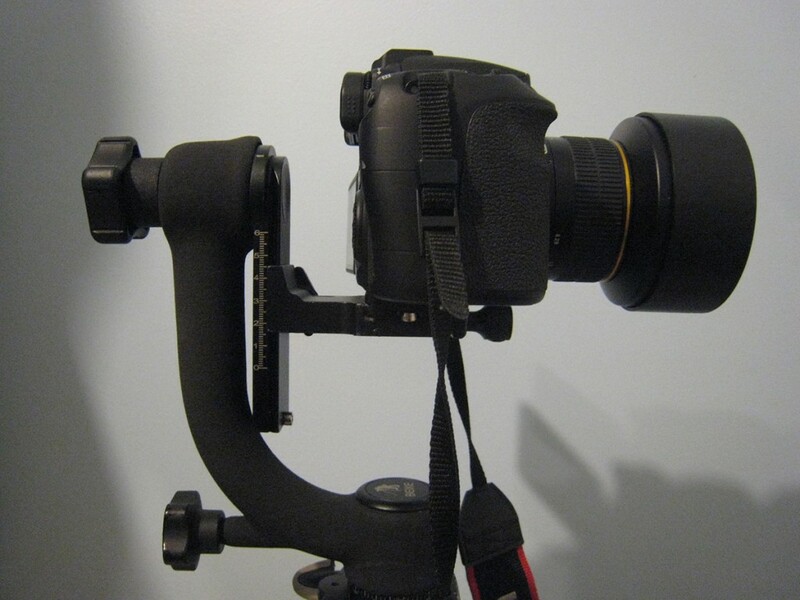 JD ∇ I use a Gimbal Tripod Head. JS ∇ Custom build CRT, from a heavy duty ball bearing and some metal/aluminum strips. Later I’ve added two heavy metal parts to get it stable and for a more smooth rotation effect. LPP ∇ I find the most difficult part is finding the sweet spot to get an image centered, how do you get your images centered? Are there any tip you can share? CT ∇ To start off with an evening’s camera rotation, I fix the camera and align by eye and take a test shot or two and adjust accordingly. A CRT is maybe not a device for someone with OCD! On my CRT, I have etched a line on the camera support plate meaning that I am more or less calibrated right away. 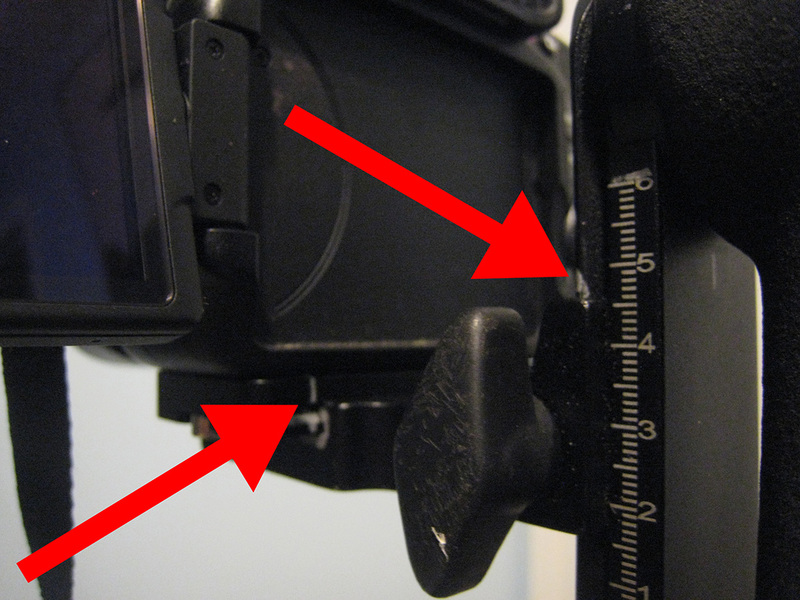 In the past, I have used a spacer such as a block of wood milled to the right size and place it along the back of the camera’s LCD screen and align from there. JULS ∇ I give a try and after a look on the camera back screen I adjust. JD ∇ Luckily my Canon 60D has a flip out screen which makes it easier to see the screen to find the center of the image. 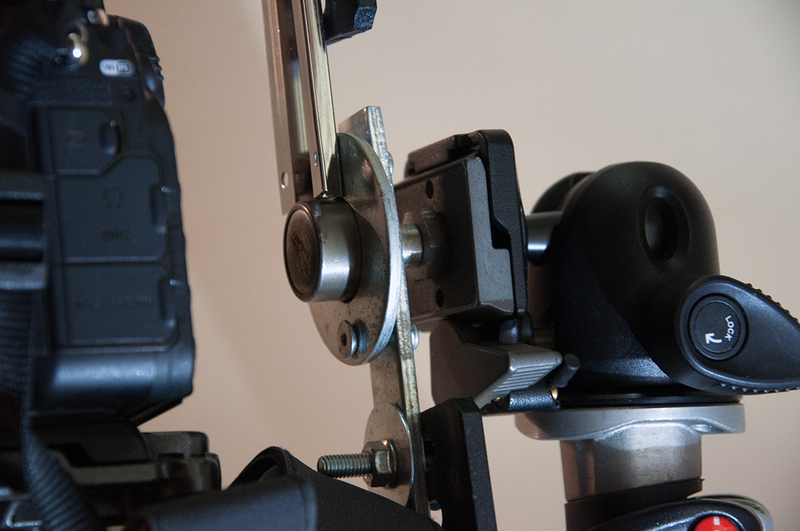 I moved the camera up and down until the lens appears to line up with the knob on the Gimbal. After spending an evening in my living room using Live View and aiming the camera at the lights on my internet modem, I found the center of the lens is just to the left of the white line of my level in Live View. With a silver Sharpie I marked the placement of the Gimbal whenever I choose to take it off, I can place it right where it was previously. Now when I prepare to shoot I use the Live View to adjust where the center of the frame will be. JS ∇ My CRT is not perfectly centered at all, and in a way this is something I thought would be a problem, but I found out that a bit off center CRT can give different cool looking patterns compared to a perfectly centered CRT. So in my case I takes more time to align and center and set the right position of the CRT, but nothing that a bit of trial and error cant fix. Otherwise I just go for it and see what happens. LPP ∇ How do you get everything level, are there some tricks or tips that you can share? CT ∇ I start by making sure the tripod is level on the spirit level bubble and the legs are locked tight, not likely to move etc. Before I align the CRT I make sure the camera itself is level using the built in level meter. Not every camera has a built in level gauge so I find it best to use a smartphone. JULS ∇ I have enough place to use a tripod ball head to adjust my camera on my pedaling mechanism. Coupled with an old Pentacon 135mm (216mm with my APSC) it’s easier to calibrate exactly my tool and to put the rotation center at the frame center. After calibrating it I often use a wide angle lens. JD ∇ I use an Angle Finder. They are about $8 at your hardware store. It has an magnetic base which is good, but once you start rotating it around you have to readjust it accordingly. There are apps out there for your phone (clinometer on Android), but I can’t mount it to my camera as it would clip the Gimbal on the 180 degree mark. There are digital angle finders out there as well but they are a little more expensive than what I use. Also wide angle lens tend to be the best. I use a 14mm Rokinon which is also good for rotating because I can lens cap between each rotation and not interfere with the focusing. LPP ∇ What do you use to get precise angles? Is it an app on your phone, a actual level or something different? CT ∇ I fix a smartphone such as an iPhone / iPod / Android device to the top of the hotshoe on the camera with a couple of cheap gadgets available off eBay. These smartphones usually have an angle gauge which is accurate enough for the job. Personally I use an old iPod touch rather than my big expensive iPhone 6s Plus! JULS ∇ I’m not looking at precise angle, I can only stop my tool with 6 different angles… Since long I have in my mind an idea to improve this but I’m still procrastinating. JD ∇ Same as above but depending how I want to rotate a subject, I have to split the rotations within 360 degrees. For example a rotation of 4 is every 90 degrees, a rotation of 6 is every 60 degrees. JS ∇My D750 has a built-in electronic-level/virtual-horizon what can be really useful for CRT use. 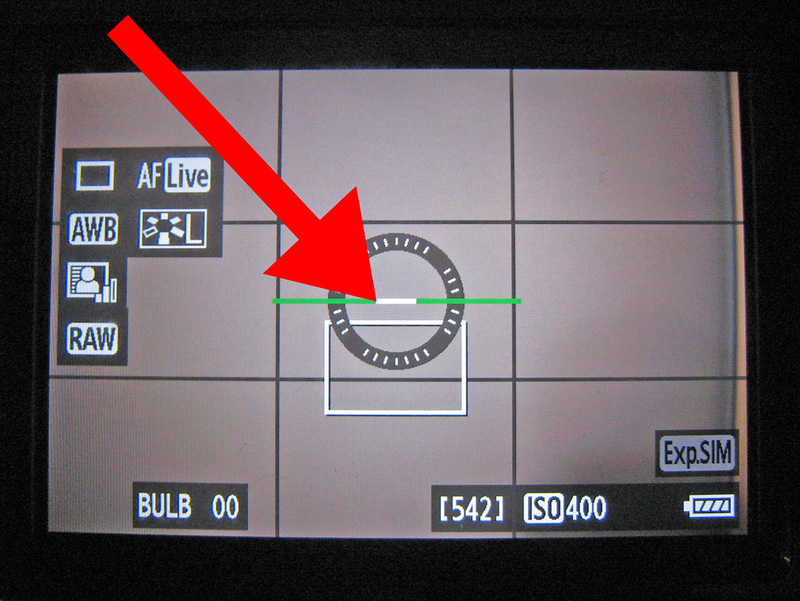 On my old D90 I used a spirit-level connected to the hot-shoe. During exposure I use small markings on my CRT to know where I have to lock the CRT for the different exposures. LPP ∇ What is your favorite “Thing” to do a camera rotation of? CT ∇ I usually prefer to go shooting CRT in city environments and try not to go for the “obvious”. I look for everyday objects such as a corner of a building or angular architecture and rotate it. 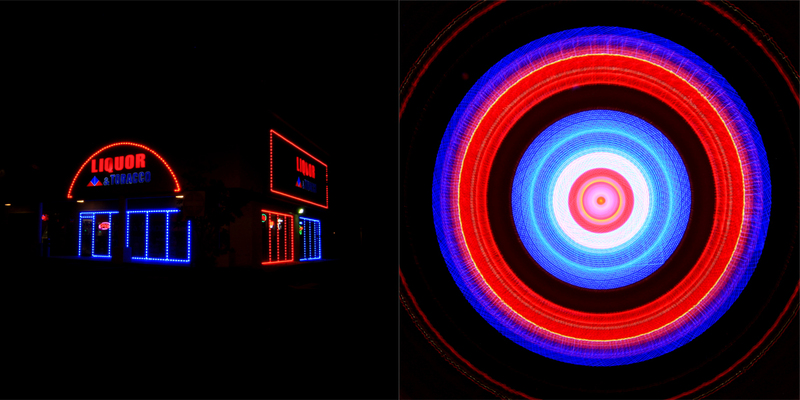 I also like to combine zoom pulling with the CRT at various angles, proper kinetic photography in my opinion! JULS ∇ I did a lot of tour Eiffel and urban landscape but in fact I prefer the way it looks with people. I realized some family portraits. JS ∇ I am always in search of the next (personal) thing/effect/challenge so I don’t have one favorite thing to CRT, but I guess my own favorite CRT shots are with tunnel/bridges and the depth and leading lines it can create. LPP ∇ I know since I started doing these a year or so ago I look at things completely different now. Is there something specific you look for when looking for a place or object to shoot for a camera rotation? CT ∇ I like to shoot in areas where there may be lights surrounded by dark areas in order to create a cleaner CRT image. I tend to aim for a corner of a building where I can only see a small amount of subject in the viewfinder and keep all the other areas in the frame dark so I don’t “light paint” or overexpose that part of the frame during the rotation process. JULS ∇ When I’m in town I pay attention to keep a small dark place in my frame to include “traditional“ light painting. It’s easiest when it’s at the center of the frame since the camera will turn around. JD ∇ I would say there has to be something bright surrounded by a dark space. So that way, when you rotate the frame the light area will overlap on top of the dark area i.e. campfire and city skylines. JS ∇ For me a CRT is a tool just like any other, it all depends and how you use it, sometimes the most crazy or weird ideas have the best effect so trying to have an open mind and thinking outside the box is key. LPP ∇ What is your favorite Camera Rotation that you have ever created and can you walk us through step by step how you created this image? CT ∇ My favorite so far has been during a collaborative shot with another light painter, Tim Gamble, using two tripods. The main subject in this case, Tim, was focused and composed on Tripod 1 without a CRT, noting focus point, focal length and Tim’s positioning for later. The camera is then transferred to Tripod 2 with a CRT, this one is then aimed off centre so that the centre of the subject is on the left hand third of the frame when the camera and tripod 2 are located on the right of centre. This may sound complicated but all we then do is open the shutter on Tripod 2 and rotate the CRT while I spin an LED lit acrylic tube in a drill at the same time for one full 360 degree revolution on the CRT. The lens cap is then placed on and the camera moved back to Tripod 1, adjusting the previously noted focus, focal length and making sure Tim is on his marker. I then spin steel wool on a drill behind Tim with more LED lights in the mix. Hope this hasn’t confused anyone! JULS ∇ I love this picture because in it there are all the ingredients I like in light painting. A pinch of urban exploration, light buddies and an environment favorable to share our passion for the light. JD ∇ My favorite so far has been a carnival ride called “Fireball”. Being a ring of light, I was hoping by rotating it 6 or 8 times it would resemble an atom. It didn’t disappoint! I aimed the center of the lens near the edge of the ring of light. I exposed it for about 5 or 6 seconds (counting in my head), lens cap, then adjust the Gimbal 45 degrees then repeat, giving me an 8 way rotation. It ended up being about a 3 minute exposure (in the middle of a crowded Fair) but it was well worth it! JS ∇ My own personal favorite is one of my very first ‘real’ CRT shots I did in 2012, this was the first time it worked out just like I had in my mind and planned. 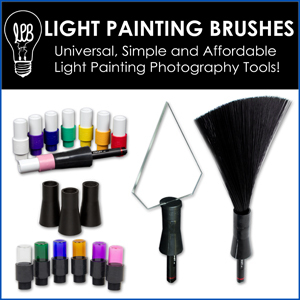 LPP ∇ What is the best piece of advice you can give for someone wanting to give the form of Kinetic Light Painting a try? CT ∇ My current thinking is that both camera and subject should move during the exposure, the effects can be quite radical and unexpected. That makes it all the more fun for me! JULS ∇ This is a creative discipline, it changes the way of seeing our environment. It may seem difficult at first but by persevering it quickly gets interesting results. Simply give it a try! JS ∇ Invest some money and buy a Gimbal to begin with (just a cheap one will do just fine) and just start experimenting with it, no rules, no right or wrong, just see what you can come up with and try to go from there.